…as promised here are the final stages of the tulip painting, described in my previous post. 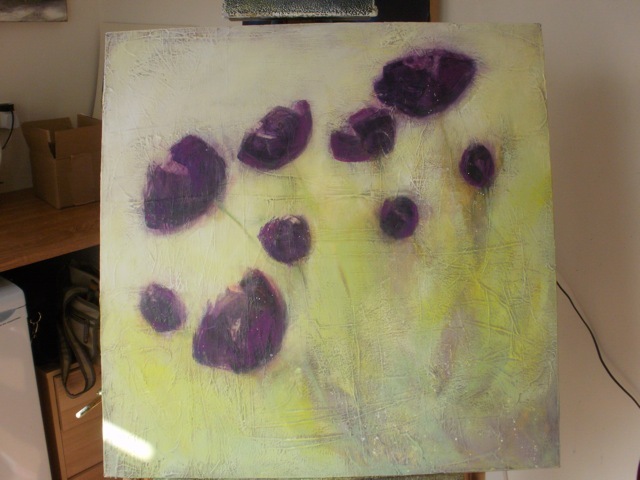 Below you can see how I added purple to the lower foreground to tie it in with the flowers themselves, knowing I would be painting over most of it, but allowing enough to show through to create depth and interest. I then brightened the foreground up again loosely with pale green (actually lemon yellow and white), wiping it back in places to allow the lower layer colours to show through. I was after an impression of these wonderful tulips bursting through spring foliage in the May garden, in sunshine. I next added dioxazine purple and quinacrodrine carmine to the flowers to bring out their colours. 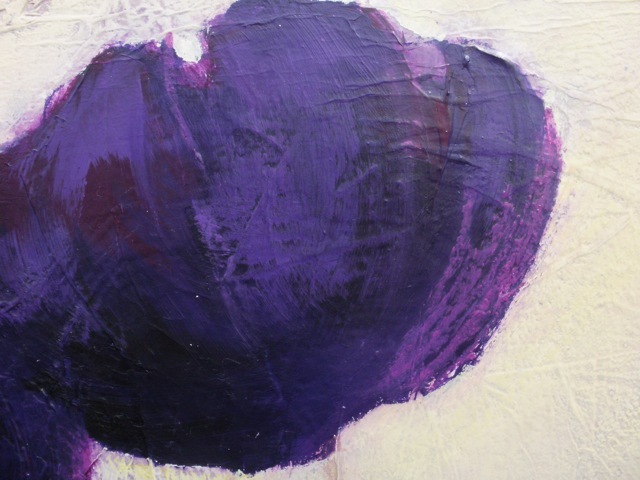 I’m grateful to Elaine Phipps, a fellow artist and friend, whose recent description of tulip petals as being like ‘plumage’, is such a brilliantly apt description of them. Once thoroughly dry, I covered each bloom with pieces of easily removable self-adhesive brown tape so I could refresh the upper background with a layer of brighter paint – you can see this in the detail image below. Tearing the tape into small pieces makes it easier to pull and push them into the natural shape of the flowers. 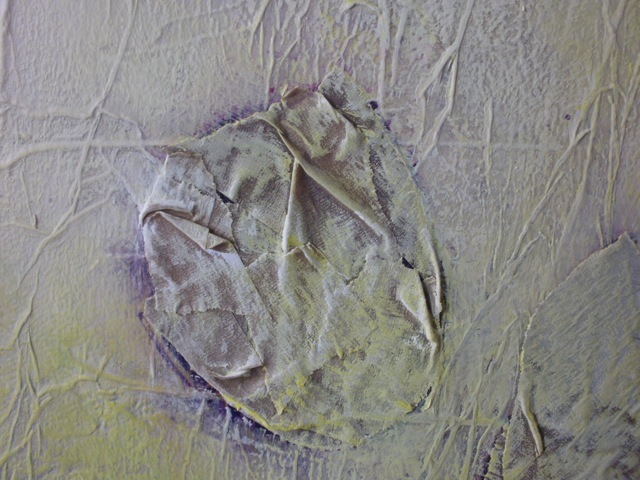 When I was happy with that area I removed the tape – a moment I love as the colours now sing out against the brighter background. As you can see in the two lower detail photos (which I really wish were actually large final works- how happy would I then be! 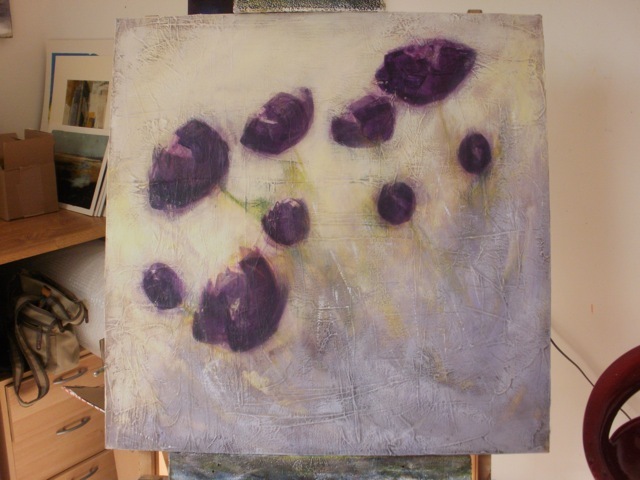 ), I then worked into each bloom with watercolour pastel in shades of light purple and carmine, to bring a liveliness and light to the flowers, giving them more definition. You can also see where I earlier splashed fine drops of dilute purple paint to enliven part of the work, and again to tie in the rich purple with the background. The last two images show the finished piece and the work in position at the Norfolk Open Studios group show at South Acre Church near King’s Lynn, a lively and varied exhibition which I spent all day on friday, along with 11 other artists, hanging (more of which in my next post). 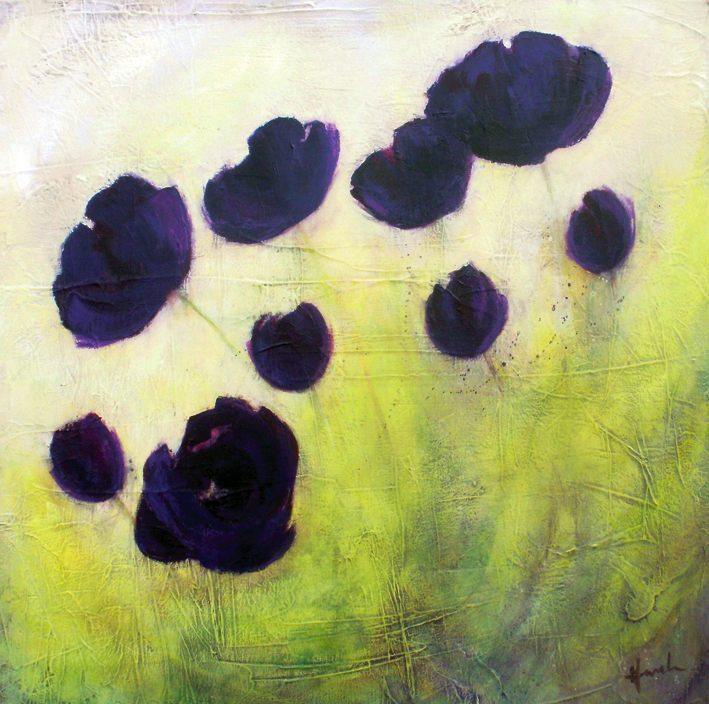 This entry was posted in Uncategorized and tagged abstract, acrylics, art, blooms, bright, detail, floral, flowers, garden, green, mixed-media, painting, pastel, petals, purple, spring, texture, tulips, watercolour pastel by mari french. Bookmark the permalink. 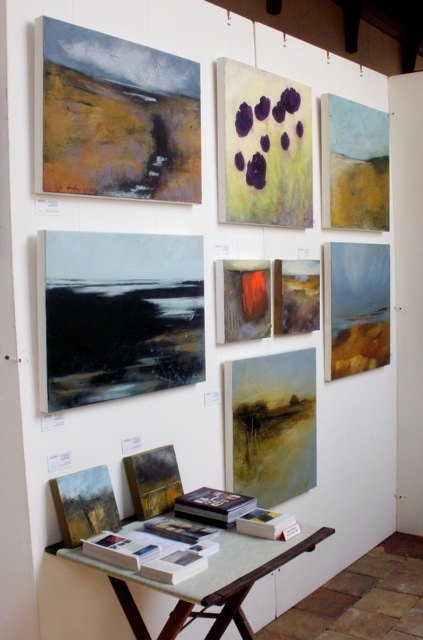 Just wanted to add – hope your exhib went well Mari! – lovely stuff, really nice man – recommended joining up so I did! Oh you must be so pleased with this Mari! The addition of the brighter colour absolutely transforms it – I loved it before but now it just sings. Do go for BIG and I think you’d interpret the insides of flowers so well – there’s so much going on – texture, colour and fantastic – almost architectural shapes. Ooohhh I’m excited – can you tell lol. I’ve been feeling bogged down (and bogged off) with my landscapes – but I’ve found a twist that has made me want to get going with them again. And then I’m going back to seascapes – oh yes. I found the development posts very entertaining, I really enjoyed watching the finished painting unfold! 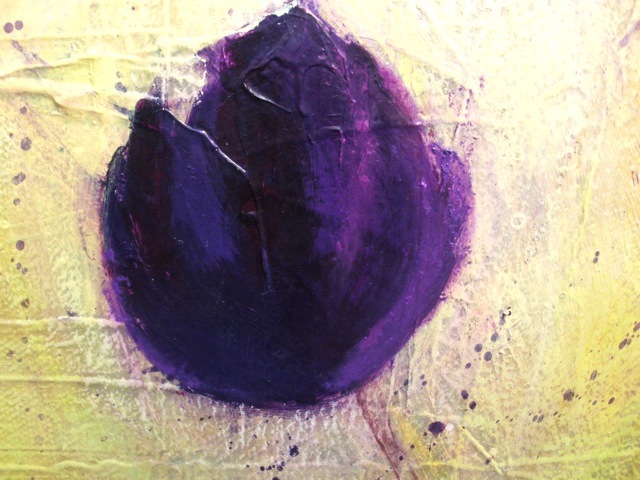 I absolutely LOVE the results…..especially the sweet deep purple of the tulips against the very tangy background! thanks sam! I have to admit though, I’m very fond of the individual details of the blooms. Maybe I’ll work towards BIG images of individual flowers once I get my next few shows over and done with! Congrats on completing the tulips, I love it. I’ve really enjoyed reading about how this painting has developed, from inspiration to technique. If you were still on Skye I’d be badgering you for a lesson but I’ll settle for the blog, keep it going! Thanks Michelle, pleased you liked the post, and it’s great to hear from you. I’ve checked out your own blog by the way and have added it to my blogroll as I think it’s really interesting and entertaining!